Autistry Studios is featured in this week’s edition of the Pacific Sun (Aug. 17, 2012). Jordan Rosenfeld writes about the effect of changes to the DSM (Diagnostic and Statistical Manual of Mental Disorders) that will place Asperger’s into the more general category of Autism Spectrum Disorder. No one is certain exactly how this new categorization will impact funding. Currently most regional centers do not financially support individuals with Asperger’s. All the more reason for us to concentrate on creating employment opportunities for teens and adults with ASD! The summer is flying by! Schools will be back in session soon and yet it seems like just the other day students were graduating. We have had a great summer at Autistry. The 2-week Summer Camp led by Courtenay was a great success and we are hoping to do more of these short, intensive sessions throughout the year. 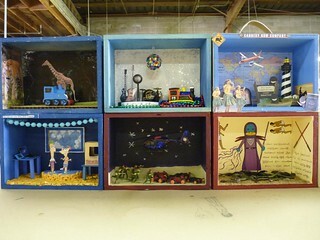 The student Little Worlds projects came out great! Though our workshops go throughout the year we do think in terms of semesters. The Fall semester officially begins on August 25th. The workshops are filling up fast but we continue to interview new students and we will open new workshops when necessary. If you would like to join Autistry send an email to Janet (janet@autistry.com). Check Our Intake Process page to learn more about how to become an Autistry student. 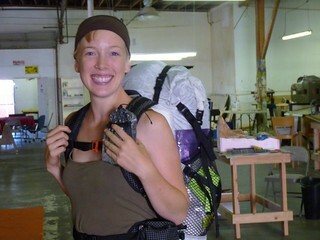 Amelia just left for her summer adventure – hiking the John Muir Trail. This will be her second trek through the High Sierras. Last year Amelia spent 3 weeks hiking the trail – solo! She is shortening her sojourn slightly this year to be back in time for the beginning of our fall semester. She has promised to send postcards when she can so we will keep you all posted on our Autistry Facebook page. Maybe next year some of our students will accompany her. Let’s start training! SAVE THE DATE: The first annual Autistry Fun and Food Faire will be held on Sunday, October 28th. We are still working out the details but there will be a fabulous brunch, activity booths, costume contests, face painting, project demonstrations and … the Dunk Dan Tank! That last activity is not to be missed! Remember all those push-ups? Well, now you have the opportunity to get your revenge. Stay tuned, more information will be coming soon.